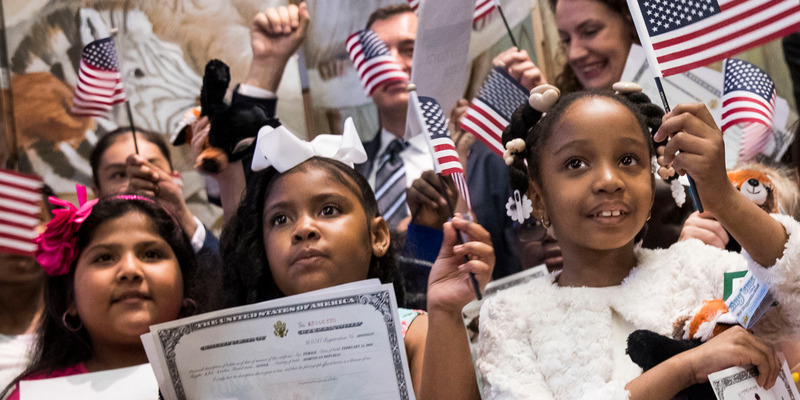 Drew Angerer/Getty ImagesChildren with certificates of citizenship after becoming US citizens during a ceremony at the Bronx Zoo on May 5. The Commerce Department announced Monday that it would include a question regarding citizenship on the 2020 Census. Many lawmakers and advocates worry the move could lead to an inaccurate count of immigrants in the US. A statistically significant miscount in the census could hurt academic research, business decisions, and the federal allocation of funds. The US Commerce Department announced Monday that the 2020 Census would include a new question on citizenship, a tweak that could send shockwaves through the world of politics and economics. The department said the census would ask whether respondents are US citizens. The Trump administration says the addition will help properly enforce the Voting Rights Act. But immigration advocates and many lawmakers expressed concern that it could undercount immigrants, particularly those in the US illegally, thus distorting the population count. The attorneys general of New York and California have already said they plan to sue the Trump administration to remove the question. Beyond the legal question – the Constitution says the census should be an accurate count of people living in the US regardless of citizenship – any miscount could also have serious consequences for state agencies, economists, and academics. Congressional votes and districts: The census is used to determine the number of Electoral College votes and members of Congress for each state. Federal and local policymaking: Federal and local politicians make policy decisions based in part on demographic data provided by the census. For instance, a city planner may use census data to determine the best location for a new school given a higher concentration of children moving into one area of the city. Emergency-response officials in South Florida also used the data to determine areas more vulnerable to major weather events. Academic and economic research depends on census data: Researchers in a wide range of academic fields rely on the data to conduct their analyses, which often help form public policy. Private business decisions:A 2015 review found that many businesses used census data to determine growth decisions, such as where to place new locations or offices. “The ACS is an important component of the information that businesses need to make decisions to help them run efficiently, hire wisely, and serve their customers’ needs,” the study said.